Reuben Hudson, our current NAWI Graz Fulbright Professor, has created a highly interesting event series dedicated to Green Chemistry topics. 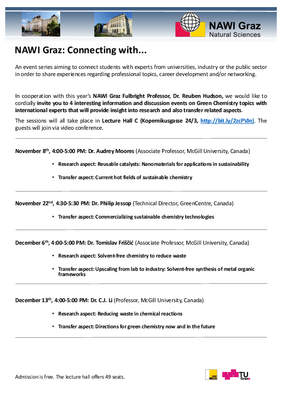 We cordially invite you to these four talks with scientists from Canada who share their expertise on various aspects of Green Chemistry on Nov 8, Nov 22, Dec. 6 and Dec. 13. Pease find all information in the attached invitation!